Cape Cod National Seashore is a National Park in the state of Massachusetts in the United States of America. Cape Cod National Seashore stretches over 43,500 acres (176 km²) of dunes, ponds, woods and almost 40 miles (64 km) of Atlantic shoreline. It is located on Cape Cod, principally in the towns of Provincetown, Truro, Wellfleet, and Eastham, but also covers some shoreline in Orleans and Chatham. Operating hours for Visitor Centers are given below in the "See" section. Parking lots are open 6AM to midnight, daily, year-round. Park Headquarters, 99 Marconi Site Road, Wellfleet, Phone: (508) 771 - 2144 Fax: (508) 349 9052. Cape Cod is relatively young geologically at 18,000 years or so. American Indians began using the land at least 9,000 years ago. In 1620, The Pilgrims, a group of English Separatists seeking to establish a settlement in Virginia were forced to land here. They sent out three separate expeditions to see what the area had to offer. During these discoveries they found their first fresh water, took some Indian corn, and almost had a battle (called the First Encounter) with some Native Americans. Cape Cod had many good features, but after a month of searching, it was decided to finally settle in Plymouth. In 1902 Guglielmo Marconi built one of two North American wireless stations at South Wellfleet. On January 18, 1903 the first public two-way communication (in Morse Code) between Europe and America occurred through this station. The station was closed in 1917 and scrapped in 1920, with the communication station being relocated to Chatham. Cable stations were later established in North Eastham and Orleans. Seashore history also includes shipwrecks and lifesaving. Two lighthouses (Highland or "Cape Cod" and Nauset) have been moved to keep them from toppling down eroding cliffs. The Cape Cod National Seashore was created on August 7th, 1961 by President John F. Kennedy. The park includes beaches, high cliff dunes, sand spits, tidal flats, salt marshes, and soft-bottom benthos. Inland there are kettle ponds, vernal pools, sphagnum bogs, and swamps. Vegetation includes pitch pine and scrub oak forests, heathlands, dunes, and sandplain grasslands. As a result of almost total deforestation by settlers between 1650 and 1900, globally rare heathland habitats have resulted here. Bayberry and beach plum are common. Twenty-five federally-protected species occur in the park. The Seashore is a significant site for the piping plover, with roughly 5% of the entire Atlantic coast population nesting here. Cape Cod National Seashore also supports 32 species that are rare or endangered in the state of Massachusetts. Some of these, such as the common tern, are conspicuous. Much less visible is the spadefoot toad which spends most its life buried in the sand, emerging only on warm nights with torrential rainfall. Spring is generally cool and damp with temperatures of 40°F-60°F (4°-15°C). Summer brings temperatures in the 70s and 80s°F (20-30°C), and cool nights. Autumn is drier than spring with similar temperatures. Winter is milder than inland, but dampness and wind chill can make winter days bitter cold. Temperatures range between 30°F and 40°F (-1° to 4°C) in mid-winter, but intervals of below 0°F (-18°C) as well as milder temperatures are also possible. Route 6 is the main Cape Cod "highway". All areas have signs from this road. From Boston travel south on Interstate 93 and Route 3 to the Sagamore Bridge where Route 6 begins. Plymouth & Brockton Street Railway, 17 Elm Av., Hyannis, +1 508-771-6191, . Service throughout Cape Cod. The Flex, Hyannis Transportation Center, Hyannis , Regional Transit Authority Customer Service: +1 800-352-7155; TTY for Deaf and Hearing Impaired: +1 508-385-4163, . Service between Outer Cape towns to Hyannis. Most travelers would fly into Boston's Logan International Airport (BOS), , or Providence, Rhode Island's T.F. Green Airport (PVD), . Cape Air, +1 800-352-0714, . Regional airline serving Hyannis, and Provincetown, with service also to the off cape cities of Boston, Providence (seasonal), and New Bedford. Beach entrance fees are collected from late June through early September when lifeguards are on duty, and on weekends/holidays from Memorial Day to the end of September. National Park Service passes can be used. $15 per day per vehicle; $3 per day for pedestrian or bicyclist. $45 - Annual pass good for a calendar year fee season. Cape Cod National Seashore passes are usually available at visitor centers starting Memorial Day, and at fee booths when they are open. General NPS passes may be purchased at Salt Pond Visitor Center (daily April 15 through October 31, and on weekends November 1 through March) and at Province Lands Visitor Center (daily Memorial Day weekend through Labor Day weekend). Some interpretive programs, including canoe lessons and trips, surfcasting lessons, and the Beach Apparatus Drill, have fees. Off-Road Vehicle (ORV) Permit. The application form for advance sales may be downloaded from the park's Oversand In-Depth link. 7 Days $40; Annual $150 (2006). Self-contained Recreational Vehicle (SCV) Permit. The application form for advance sales may be downloaded from the park's Oversand In-Depth link. 7 Days $75; Annual $225 (2006). Campfire permits. Free permits for beach campfires at the park's six swimming beaches are available at park visitor centers. Reservations may be made up to 3 days in advance by calling Salt Pond Visitor Center at 508-255-3421 for beaches in Eastham and Wellfleet; and Province Lands Visitor Center at 508-487-1256 for beaches in Truro and Provincetown. Four permits per day, per beach are issued. Permits must be picked up the day of the fire at the reserving visitor center, by 3:30PM. Wedding, special event, and commercial filming permits. Contact the Chief Ranger's office at +1 508-349-3785, ext 214 for details, and an application. 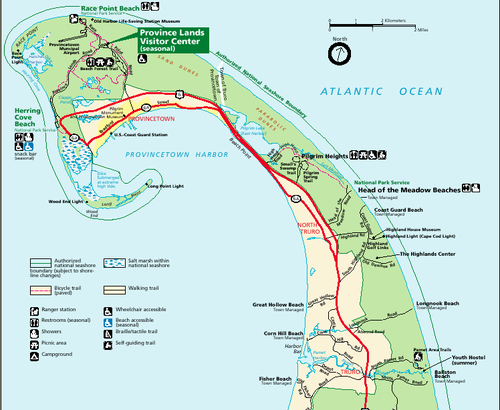 Most people would use a car in order to explore all areas of the Cape Cod National Seashore. Experienced bicyclists could use that method. 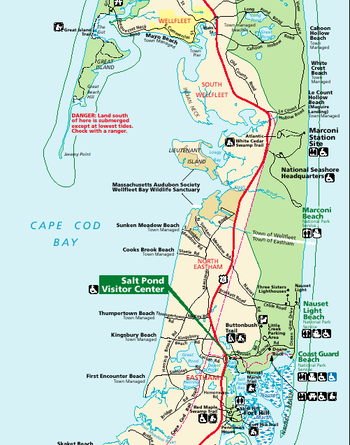 The Cape Cod Rail Trail connects the Marconi area and the Salt Pond Visitor Center. Salt Pond Visitor Center, corner of Nauset Road and Route 6, Eastham, +1 508-255-3421. Open every day 9AM-4:30PM (increased hours during the summer). The Seashore's main visitor facility offers views of Nauset Marsh and the Atlantic, with frequent orientation movies, a comprehensive museum, bookstore and restroom facilities. Five short films daily on a rotating schedule in an indoor theatre. This Visitor Center is also convenient to the popular 1.5 mile Nauset Marsh Trail and the Buttonbush Trail, a quarter-mile multi-sensory trail that features a guide rope and text panels printed in large lettering and Braille. The Nauset Bicycle Trail is also nearby. A museum collection reflects the vast range of natural and cultural themes represented on Cape Cod. Artwork from prominent artists is displayed, and in the atrium, the museum highlights the Cape's complex and diverse natural history of the Outer Cape. Displays cover salt marsh plants and animals, beach dynamics, upland plant communities and prominent residential and migratory birds. Doane Rock, 1 mile past Salt Pond Visitor Center on Doane Road. This large boulder was brought here by the glaciers that created Cape Cod. A great spot for climbing (no equipment necessary). The back side (close to trees) is very hard to climb, and should not be attempted by beginners. Easy to access via bike paths and trails. Province Lands Visitor Center, Race Point Road, Provincetown, +1 508-487-1256. May-October 9AM-5PM. An observation deck provides a 360-degree view of the Province Lands dunes, the Outer Beach and the Atlantic Ocean. From this location you can see Race Point Ranger Station, Race Point Beach, the Old Harbor Life-Saving Station and the Pilgrim Monument in Provincetown. Exhibits about local plants and animals and the Pilgrim's landing in Provincetown are featured. Five short films daily on a rotating schedule in an indoor theatre. Bookstore with books, tapes, videos, toys and gifts related to Cape Cod. Highlands Center, Old Dewline Road, Truro (off South Highland Rd. ), +1 508-349-3785 x208. This area is under development by partnership with AmeriCorps Cape Cod, Fine Arts Work Center in Provincetown, Highlands Center, Inc., and Payomet Performing Arts Center in Truro, with the mission of fostering "the unique cultural and natural heritage of Cape Cod by facilitating scientific research, the arts tradition, and educational programs". The eighty acre site is the former North Truro Air Force Station atop dramatic sea cliffs. Fort Hill Area, off Route 6, Eastham. Nice panoramic views of Nauset Marsh and access to Red Maple Swamp Trail (half mile long). Limited parking, seasonal restrooms. Atwood-Higgins House, back roads to Bound Brook Island, Wellfleet. Inquire at the Visitor Center about visiting this 18th century house. Pilgrim Heights, off Route 6, North Truro. Nice views of kettle hole and dunes from the bluff. Picnic area, seasonal restrooms. Old Harbor Life-Saving Station, Race Point Beach, Provincetown. Occasional open houses. Take a ranger guided tour . The Seashore has eleven self-guided trails. Individual self-guiding trail folders are available at some trailheads. Many have picnic areas. Fort Hill Trail, Governor Prence Road (off Route 6). This 1.5 mile, moderately difficult trail offers great views and connects with Red Maple Swamp Trail. Red Maple Swamp Trail, off Fort Hill Trail (above). One-half mile trail of moderate difficulty has boardwalk sections winding through the swamp. Some tree roots in trail. Great fall walk. Buttonbush Trail, adjacent to Salt Pond Visitor Center, Route 6. This quarter mile trail with a boardwalk bridge over Buttonbush Pond features a guide rope and Braille and large text. Blindfolds optional! Thirty minutes without. Nauset Marsh Trail, adjacent to Salt Pond Visitor Center, Route 6. Easy one mile trail along the shore of Salt Pond and Nauset Marsh over fields and through a recovering forest. Great views. Doane Trail, Doane Road (on the way to Coast Guard Beach). Easy half-mile paved trail loop through pine and oak forests to large glacial rock with marsh views. Atlantic White Cedar Swamp, Marconi Station area. An award-winning 1.25 mile trail descending through a stunted oak and pine forest into a mature woodland where a boardwalk leads through the picturesque swamp. Moderate difficulty, return route is 1/2 mile in soft sand. Great Island Trail, Chequesset Neck Road. Six mile (or optionally eight mile) trail that runs along Great Island and Great Beach Hill, skirting salt marshes and giving great views on the way to Jeremy Point. The park's most difficult trail with soft sand, some log steps and portions submerged at high tide. Optional routes can be confusing. CAUTION: Do not attempt when tide is rising. Pamet Cranberry Bog Trail, North Pamet Road. One mile trail with a steep quarter-mile spur to overlook. Old abandoned cranberry bog. Moderately strenuous with many log steps. Small's Swamp Trail, Pilgrim Heights area off Route 6. Easy 3/4 mile loop. Pilgrim Spring Trail, Pilgrim Heights area off Route 6. Easy 3/4 mile loop through recovering pine and oak forest. A marker commemorates an area representative of where the Pilgrims first drank. Beach Forest Trail, Race Point Road at parking lot 1/2 mi from traffic light on Route 6. One mile easy walk in sand, past pond and through dunes. All have paved parking, showers and rest rooms (seasonal if not at open visitor center), changing rooms, drinking water, water quality testing, and lifeguards (late June through Labor Day). Coast Guard in Eastham and Herring Cove in Provincetown, are handicapped accessible and have wheelchairs capable of traveling over sand. Parking lots are open from 6AM to midnight, daily, year-round. Coast Guard Beach, Nauset Road off Route 6, Eastham. Parking area fills between 11AM and 1PM daily with moderate turnover. Beach access via Little Creek Shuttle and parking area, a half mile away. Drop off and pick up of passengers and belongings at the beach is PROHIBITED. Limited handicapped parking (state issued plate or placard required) at the Coast Guard Station parking area. Nauset Light Beach, Nauset Road off Route 6, Eastham. Parking area always fills during July and August, barring bad weather. Arrive before 9:30 AM to ensure a space. Has filled up before then on very hot days. Marconi Beach, off Route 6, Wellfleet. Parking area rarely fills during late June and July. Parking area will fill occasionally in August with moderate turnover. Perhaps the most beautiful beach. Head of the Meadow Beach, Truro. Parking area rarely fills. Good beach for young children. Race Point Beach, Race Point Rd (off Route 6), Provincetown. Parking area rarely fills during June and July. When the parking area does fill, it is usually one to two hours after the Herring Cove lot fills. Great beach for watching sunset. Popular with fisherman. Herring Cove Beaches, off Route 6, Provincetown. Seasonal snack bar. Parking area fills between 10AM and noon most days throughout the summer. Moderate turnover after 1PM. Access to Herring Cove Beach is also available on the Provincetown-Truro shuttle. Great for watching sunset. Do not disturb natural or cultural features. All are protected by federal law. Glass containers, flotation devices (rafts, rubber-tubes), snorkels, and masks are prohibited on any life-guard-protected beach. Pets must be leashed and under control at all times. Leashes may not exceed six feet. Pets are not permitted in public buildings, picnic areas, on protected beaches, or on self-guiding trails. Licences are now required for saltwater fishing in Massachusettes: they cost $10 per license for resident/non residents between age 16 and 59, they are free of charge after age 60 (Inquire at Mass Marine Wildlife and Fisheries; a separate fee is still required for a state freshwater fishing license (inquire at Mass Wild Life). Town licenses for shellfishing are required. Regulations and fees vary by town. Surfing and windsurfing are permitted in waters outside lifeguarded beaches. Permits are required for all beach fires. They may be obtained on a first come, first serve basis at Salt Pond and Province Lands Visitor Centers. Do not bury coals. Sand collapses easily. Climbing slopes or digging deep holes above knee level is hazardous and prohibited. Most of the shoreline between Head of the Meadow Beach in Truro and Race Point Light is open at various times between July 1 and November 15, subject to permitting and equipment requirements. The section between Long Nook Beach and Head of the Meadow Beach is open April 15 to November 15 for night fishing only. Operators: Registered owners and other operators must have a valid state operator's license; view an educational orientation program each season; and abide by all Seashore and off-road regulations. Vehicles: 4-Wheel/All Wheel Drive Vehicles or Self-Contained recreational vehicles must have: a valid state registration, inspection sticker, insurance, tires meeting standards outlined in this brochure and all required accessory equipment. Rental vehicles are prohibited. Nauset Trail, Salt Pond Visitor Center, Eastham. 1.6 miles. Head of the Meadow Trail, Head of the Meadow Beach to High Head Rd, Truro. 2 miles. Province Lands Trail, Access points (all in Provincetown): Beech Forest parking area; Province Lands Visitor Center; Race Point Beach parking area; Herring Cove Beach parking area (beach fees may apply at the latter two). 5.5 mile loop with about 2 miles in spurs. CAUTION: Old trail, not designed for speeds over 10MPH. Eastern National runs bookstores at the Visitor Centers, selling books, tapes, videos, toys and gifts. The park has no restaurant services. However, you can go into the towns and find any food you could think of. Glass containers are prohibited on the beaches. The Seashore itself offers no individual lodging, however all Cape Cod towns have lodging. Hostels are available in Eastham and Truro. See individual town articles for hotels/motels/bed and breakfasts. NEED Program, . The National Park Service residential environmental education program at Cape Cod National Seashore, known as the NEED program, offers educational groups an opportunity to experience the many natural and historical wonders of Cape Cod on a multi-day basis. The NEED building, once a US Coast Guard surf-rescue station, is located on a spectacular vista overlooking the Atlantic Ocean at Coast Guard Beach in Eastham. The NEED building is a heated, year-round facility, which provides overnight accommodations for groups ranging up to 35 participants. Bookings are usually made six to eight months in advance. The Seashore offers no camping. Some campgrounds are nearby to, or surrounded by, Seashore lands. See listings in individual towns. Camping is by permit and only in designated areas on Race Point Beach. Camping is limited to 100 vehicles per night and restricted to 21 days per vehicle from July 1 through Labor Day. Variable beach conditions and temporary beach closures may result in temporary or permanent changes in the locations and boundaries of the designated camping areas. All self-contained vehicles arriving for an overnight stay must register at the Off-road Vehicle Station at Race Point area before going onto the beach. An overnight authorization permit will be issued at this time. If arriving after hours you must register by 9AM the next morning. Reservations are required for July 4 and Labor Day weekends and are accepted by mail only with postmarks from January 1-15. Reservation requests must specify either July 4, Labor Day, or both. Reservations will be confirmed by mail. All reservation requests should be mailed to: Cape Cod National Seashore, Attn: Self-Contained Reservations, 99 Marconi Site Road, Wellfleet, MA 02667. Rip currents and undertow are common, dangerous conditions along ocean beaches. Swim in lifeguard protected areas and if caught in a rip current free yourself by swimming parallel to the beach first. Take precautions to avoid contact with ticks and mosquitoes. Deer ticks may carry lyme disease. Mosquitoes may carry encephalitis or the West Nile virus. Stay on trails and out of tall grasses. Use repellent and wear proper clothing. Be alert for bicycles and pedestrians on the Seashore's narrow roads. Other areas of Cape Cod are also popular destinations. Next try Boston, Providence, RI or Newport, RI. This page was last edited on 23 March 2017, at 17:06.